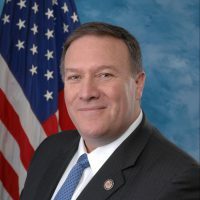 Prior to joining the Trump Administration, Mr. Pompeo was serving in his fourth term as congressman from Kansas’ 4th District. He served on the House Intelligence Committee, as well as the Energy and Commerce Committee and House Select Benghazi Committee. As Acting Under Secretary of Public Affairs and Public Diplomacy, Nauert represents the Secretary of State on the board.